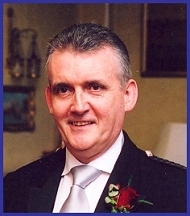 David has a cheerful and out-going personality; his reputation has been built upon giving the client exactly what they require, whilst maintaining a professional approach he has also gained a wealth of experience and proves to be a very popular Civil Celebrant and Toastmaster with clients from all walks of life. Q: Why did you become a Celebrant? A: Being Professional Toastmaster & Master of Ceremonies this heavily involves me in the wedding scene. While being present at many Civil Wedding Ceremonies held in hotels and Stately Houses licensed for that purpose, I felt that it was not personal enough. I became desperate to find out more. How could it be made more personal? Why can the ceremony only take place between certain times? Why only in a fixed Structure licensed for that purpose? A: I have had 20 years in a public service background, dealing directly with members of the public. Some of my free time, I spend singing in a Male Voice Choir. I have organised various functions, Weddings, Masonic Ladies Nights, Charity Events etc. It was this that increased my passion for dealing with members of the public and subsequently, led me to train as a Professional Toastmaster & Master of Ceremonies at the United Kingdom School of Professional Toastmasters Ltd. It seemed like a natural progression; a culmination of my previous experience and interests. My interest in ceremony led me to research in training to become a Civil Celebrant. 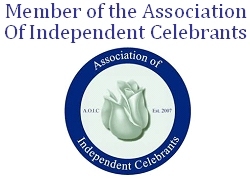 After my training and qualifying at the United Kingdom College of Celebrancy, I received my College Certificate and subsequently became a Member of the Association of Independent Celebrants. I now officiate at Weddings, Renewal of Vows, Baby Naming to name but a few.